We may not have Matthew when Downton Abbey returns in the United States for its fourth season in January, but we have a very simple way to drown our sorrows over his loss: Downton Abbey wine. 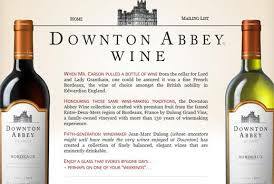 The recently launched Downton Abbey Wine Collection is a perfect pairing for the Dowager, Mary, the servants and all. It features two Bordeaux blends, Downton Abbey Blanc and Downton Abbey Claret. Just like the stuff Carson pulls from the cellar, the branded wines are from Bordeaux—in this case, from the Entre-Deux-Mers region. The winemaker describes the white as light and crisp and the red as medium-bodied with bright fruit and a silky finish. They’re available online at Wine.com and DowntonAbbeyWine.com for $14.99 per bottle.